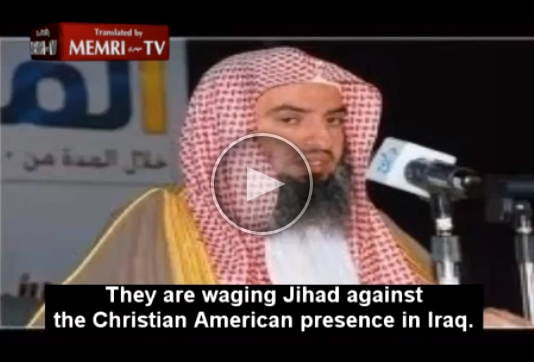 In a video-clip posted on the Internet on August 30, Sheik Muhammad Al-Suhaybani, Imam of the Prophet’s Mosque in Medina, Saudi Arabia, called to support the mujahideen who wage Jihad against the Christian American presence in the Middle East. Sheik Muhammad Al-Suhaybani: All the pure blood that has been shed in Iraq for decades…Against whom are they waging their Jihad? They are waging Jihad against the Christian American presence in Iraq. In Somalia and Afghanistan – is it not Jihad? Are they not God-fearing? You (Arab rulers) have been remiss and neglectful, so you should have kept your mouths shut. Under these circumstances, you should have kept silent and feared Allah. Instead of that, they accuse the mujahideen of being kharijites…Why? Did they rebel against the Emir of the Believers? No, they rebelled against infidels who invaded their countries. We pray for Allah to guide those (critics), so that they stop criticizing the mujahideen. If they do not pray for their success, they should at least stop criticizing them. In general, I consider them to be mujahideen for the sake of Allah, who are driving out the infidels who invaded their lands.